Confederacy Treasury Dept cover Various departments of the Confederate government used envelopes which were printed with the names of their department. Examples where the words 'Official Business' occurs are common. The postage stamps and postal system of the Confederate States of America carried the mail of the Confederacy for a brief period in American history. Early in 1861 when South Carolina no longer considered itself part of the Union and demanded that the U.S. Army abandon Fort Sumter, plans for a Confederate postal system were already underway. Indeed, the Confederate Post office was established on February 21, 1861; and it was not until April 12 that the American Civil War officially began, when the Confederate Army fired upon US soldiers who had refused to abandon the fort. However, the United States Post Office Department continued to handle the mail of the seceded states as usual during the first weeks of the war. It was not until June 1 that the Confederate Post office took over collection and delivery, now faced with the task of providing postage stamps and mail services for its citizens. The CSA Constitution had provided for a national postal service to be established, then required it to be self-financing beginning March 1, 1863 (Section 8. Powers of Congress, Item 7). 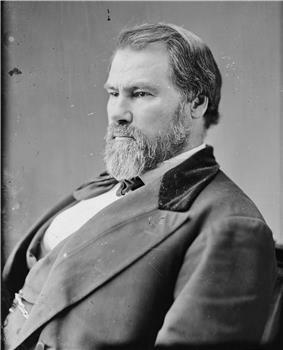 President Jefferson Davis had appointed John Henninger Reagan on March 6, 1861, to head the new Confederate States of America Post-office Department. The Confederate Post Office proved to be very efficient and remained in operation for the entire duration of the Civil War. 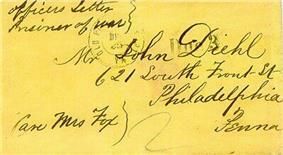 Prisoners' Mail from the American Civil War, by Galen D. Harrison. Union and Confederate Civil War covers from prisoners of war in 83 Union and 58 Confederate Prisons, compiled from a total over 2,700 covers. Anderson, John Nathan. (2013) "Money or Nothing: Confederate Postal System Collapse during the Civil War," American Journalism, 30 (Winter 2013), 65–86. 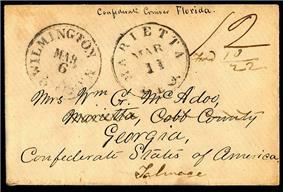 ^ "Confederate States Post Office". Smithsonian National Postal Museum. Retrieved 17 November 2010. 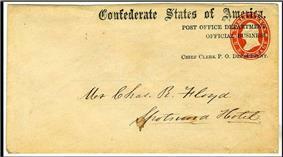 ^ "History of the Confederate States Post Office Service". New York Times; about.com . Retrieved 17 November 2010. ^ a b Boyd B. Stutler, 1962. 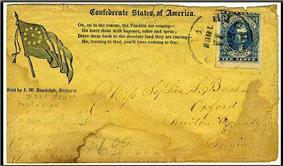 "The Confederate Postal Service in West Virginia". West Virginia Archives and History . Retrieved 19 November 2010. ^ "U.S. 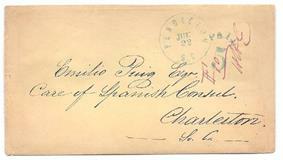 Postal Issue Used in the Confederacy (1893)". Smithsonian National Postal Museum. Retrieved 29 January 2011. ^ "Express Covers". S.N.P.M.. Retrieved 17 November 2010. ^ "JOHN H. REAGAN - The Old Roman". John H. Reagan Camp #2156; Sons of Confederate Veterans. Retrieved 17 November 2010. ^ a b "Shortage of Postal Supplies". S.N.P.M.
. Retrieved 17 November 2010. 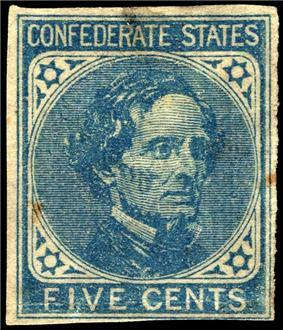 ^ "Confederate Postage stamps". S.N.P.M.. Retrieved 17 November 2010. 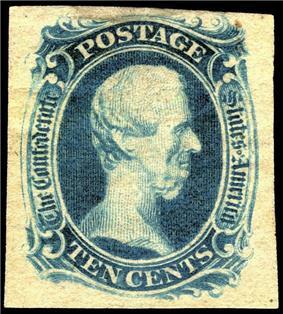 ^ "Thomas Jefferson, 10-cent Blue". Smithsonian National Postal Museum. Retrieved 4 January 2011. ^ "2-cent Green Andrew Jackson". Smithsonian National Postal Museum. Retrieved 6 February 2011. 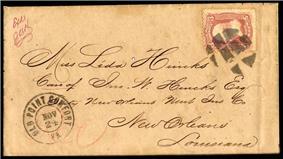 ^ """10-cent Jefferson Davis "T-E-N. Smithsonian National Postal Museum. Retrieved 6 February 2011. 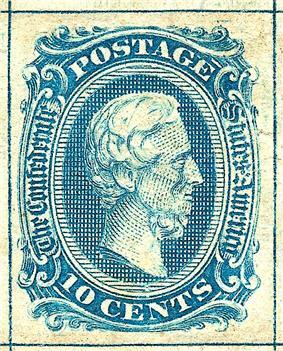 ^ "10-cent Jefferson Davis, Type II". Smithsonian National Postal Museum. Retrieved 6 February 2011. ^ "Contrived Confederate Covers". John L. Kimbrough MD Colonel USAF MC (Ret). Retrieved 31 January 2011. 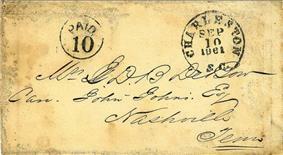 ^ ""Declaring a stamp a forgery . Stamp Community Family (APS Chapter). Retrieved 29 November 2010. ^ ""American Civil War: POW camp at Andersonville . New York Times, about-com. Retrieved 17 November 2010. ^ ""Civilian Flag-of-Truce Covers . S.N.P.M. Retrieved 17 November 2010. ^ a b ""Prisoner mail exchange . Prisoner of War mail, Smithsonian National Postal Museum. Retrieved 17 November 2010. ^ "Prisoner of War Camps". Family History 101,. Retrieved 17 February 2011. ^ a b c d e "Tales from the Blockade, essay". Richard Frajola, philatelist and historian. . Retrieved 17 November 2010. ^ a b "Blockade essays" (PDF). Retrieved June 8, 2010. ^ a b c "Blockade-Run Covers". National Postal Museum, Blockade-Run Covers . Retrieved 17 November 2010. 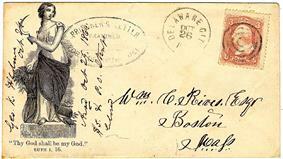 CSA Stamp on cover from Richmond, Va. 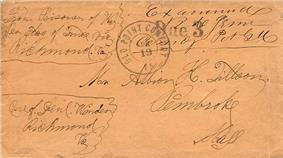 Various departments of the Confederate government used envelopes which were printed with the names of their department. Examples where the words 'Official Business' are used are common, but these envelopes were not official in any way, and required payment of postage, unlike official envelopes of the US government whose postage is free, referred to as the free franking privilege. 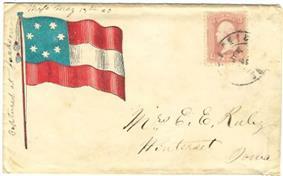 1862 Washington, D.C. cover with 3c Washington 1861 Issue to Enfield Center, N.H. Red Patriotic Eleventh New Hampshire Regiment. The CSA ended franking privileges on March 15, 1861, but the CSA Post Office made provision that allowed the postmaster general and other officials in the CSA Post Office to send official mail free of charge when endorsed “Official Business” over their signatures. 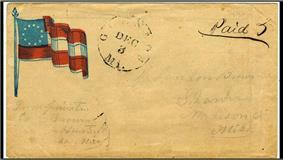 Confederate POW cover mailed from Washington, D.C. on May 22, 1865, (after Lee's surrender), Class B. 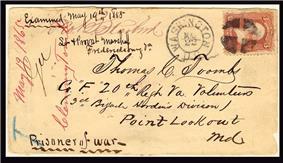 Addressed to Thomas C. Trombs, Point Lookout, MD. Examined and manuscript marking by censor at Fredericksburg, Virginia, May 19, 1865. 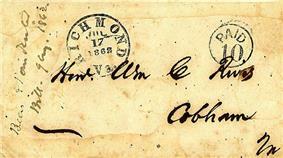 Mail from Virginia bearing a manuscript Virginia town, "Gravelton, Va" with postmaster’s signature.“H. A. Camp PM” ties the CSA stamp to cover, dated "Feb 27, 1865". Manuscript “Gen Ould Commissioner Exchange Richmond, Va” at upper left. 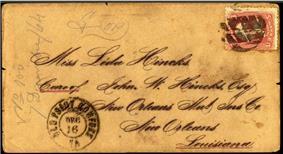 Cover sent via Fortress Monroe Va with Old Point Comfort, Va double-ring Postmark, Mar 25, 1865, and the US stamp tied with cork cancel. 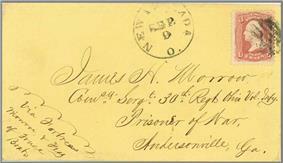 Cover is postmarked Delaware City, Delaware, August 9, 1864, bears a Federal prison mark, confirming examination of the prisoner's letter. Cancel for stamp is a concentric circle killer. 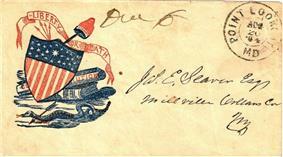 Cover mailed after the new uniform postage rate of ten cents had gone into effect, July 1, 1862. 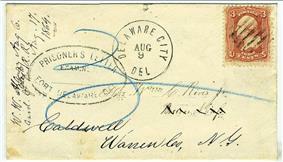 Fort Delaware, postmarked Delaware City, Delaware, August 9, 1864, with Federal prison mark, indicating prisoner's letter was examined. 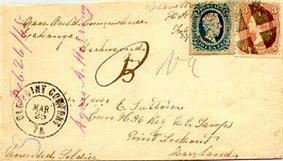 The 1861 3-cent Washington issue is the most frequently found on Civil War era mail. Confederate 10-cent Thomas Jefferson. 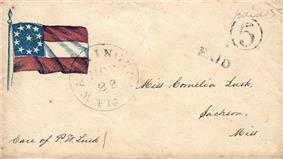 Postmark, Richmond, Virginia, November 11, 1861, circular date stamp on eleven-star flag patriotic envelope to Oxford, Georgia. Manuscript covers are addressed envelopes that were designated as Paid or where the amount of postage due was hand-written with pen and ink. Manuscript markings can also be found along with various hand-stamp markings, or in combination with postage stamps, which were sometimes applied prior to or after the manuscript marking(s). 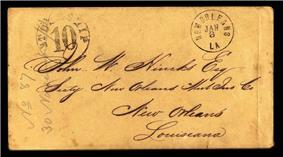 If the manuscript cover was mail carried by a blockade runner, the cover is usually referred to then as a blockade cover, and so forth with patriotic and other covers. Mourning covers are also widely collected. These are covers which bear signs of sympathy or recognition of an adverse event. 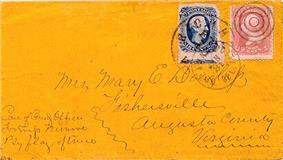 The most common type of adversity cover that occurs in Civil War postal history, Confederate or Union, are what is referred to by collectors as Mourning covers. Many families shared in the loss of loved ones and friends who died in battle during the four-year war. Letters of sympathy were often sent between family members and friends. 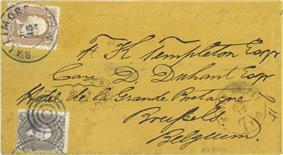 The covers often bear various markings, usually pen inscribed by the sender. One of the most common markings found on these covers is the symbolic black border put about the outer face of the envelope. 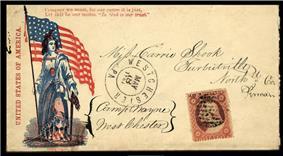 As many thousands of men died during the war, the black border became commonplace in the Union and Confederate mail streams and in Civil War philately. Due to the Union blockade, the South was unable to get many needed basic supplies including paper, and as such envelopes and writing paper were scarce throughout most of the South. People would reuse old paper and envelopes, bags, and old forms and sometimes would use wallpaper to construct envelopes with. These covers are usually referred to by collectors as adversity covers. 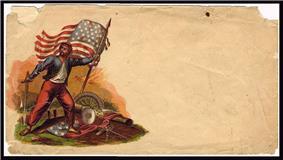 The years during the American Civil War were a period marked with strong sentiments and loyalties towards both sides involved, and this sentiment is clearly displayed on various Civil War correspondence known to collectors and historian as Patriotic Covers. 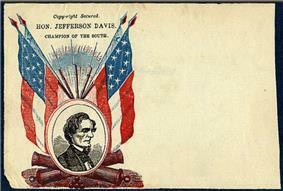 Citizens, many of whom had family members and friends off fighting in the war, or who had died in battle, often expressed their loyalties with envelopes illustrated with flags, portraits, slogans and allegorical figures such as that of Liberty, which clearly captured the sentiments of that time. This practice was most evident in the North where there were many printers, especially in the larger cities, who produced an assortment of envelopes that proudly displayed these designs and which quickly became popular among the citizenry. The situation in the south was quite different. The demand for printers in the agrarian South was much less, and consequently established and qualified printers were generally nonexistent throughout most of the Confederacy. The South also lacked the North's industrialized advantages and supplies, and so the various Confederate patriotic covers that have survived the years are scarce and rare and usually have considerable value. 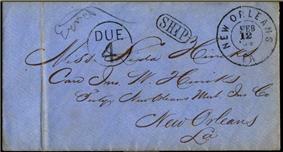 figure 2 Confiscated outbound mail from captured blockade-runner, the Nuestra Senora de Regla. Cover used as evidence and bears a red manuscript court docket of HHE. 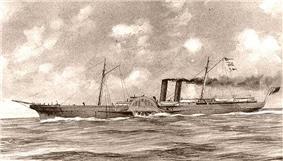 Among the most notable blockade runners were steamers like the SS Syren, a 169-foot (52 m) steel-hulled sidewheel steamer that made a record 33 successful runs through the Union blockade. Another steamer called the Alice, a 177-foot (54 m) steel-hulled vessel, made 24 successful runs, while the Kate, a wooden-hulled steamer, made 20 successful runs before being run aground in November 1862. It is likely that most of the blockade runners brought mail into the Confederate mail stream, as the Confederate states were in dire need of basic supplies, the procurement of which was conducted through mailed correspondence. The various cargoes would likely have mail attached to them to notify various parties that their shipment has arrived at port. 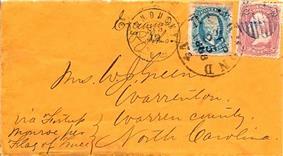 Today, Confederate blockade covers are highly sought after by collectors and historians who often regard these mailings as figurative time-stamps and historical confirmation that various people, ships and post offices existed in and among these times and places. During the beginning of the Civil War, getting Confederate mail in and out of the Confederacy to and from foreign suppliers and other interested parties overseas posed a problem. At first, getting a ship through the Union blockade was easier, but as the war transpired the number of Union ships on blockade patrol increased while veteran crews were becoming more experienced and growing wiser to the evasive tactics employed by blockade-runners. To escape detection, blockade-runners would often try to get the mail and cargo through by making night runs, especially when the moon was new. Many of the vessels were also painted a dark gray color to help them blend in with the backdrop of the night sea, a practice that earned these vessels the nickname of Greyhounds. Some of the steamers also burned a smokeless anthracite coal which greatly reduced their profile against the horizon. However, as the war went on, the prospect of getting a ship through diminished greatly, and many of these ships faced capture or destruction, their cargoes and mail never reaching their ports of destination. As many of the vessels used as blockade-runners were built in England for British investors, the captured crews and passengers were usually British also. The cargo aboard was rewarded to the captain and crew of the capturing vessel, it is assumed as an added incentive for captains and crews on blockade patrolling ships to be extra vigilant. Mail was also confiscated and sometimes used as evidence against the parties involved with the ship and its cargo. 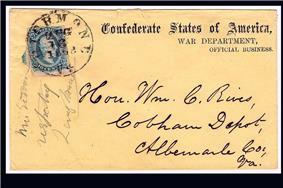 (figure 2) Consequently inbound covers that were prepared by forwarding agents for transfer to and delivery within the Confederacy never received various postmarks or other markings from the Confederate post office. At the onset of the American Civil War it was imperative for the Confederacy to get crucial correspondence to suppliers and other mail into and out of the country. On April 19, 1861, President Lincoln proclaimed a blockade along the entire coastline of the Confederacy to prevent it from obtaining supplies and to prevent it from communicating with the rest of the world by means of mail. Twelve major ports and approximately 3,500 miles (5,600 km) of coastline along the Confederate States were patrolled by some 500 ships that were commissioned by the US Navy; however, some accounts vary considerably and place the number of commissioned ships for blockade patrol at about 200, taking into account the high numbers of Union ships that were withdrawn from blockade duty for repairs. The blockade played a major role in the Union's victory over the Confederate states. By the end of the Civil War, the Union Navy had captured more than 1,100 blockade runners and had destroyed or run aground another 355 vessels. The Union blockade reduced a vital source of revenue for the south, cotton exports, to a fraction of what they were prior to the war, as well as preventing much of its mail from being sent or received. (See also: Anaconda Plan) In response to the blockade various specially-built steamers were built and put to use by British investors who were heavily invested in the cotton and tobacco trade. These vessels were typically smaller and lighter in weight, often giving them an advantage of maneuverability and record speeds of up to 17 knots, which enabled them to evade or outrun Union ships on patrol. Their cargoes were usually small, light-weight and often included mail. 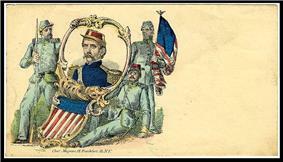 When the Civil War got underway, both sides were ill prepared to deal with the very large numbers of captured troops. For a time a prisoner and mail exchange program was in use that lasted until June 1863, when the U.S. Government terminated any further cooperation due to mounting war tensions and increased mistrust. 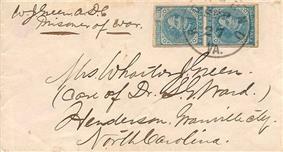 The postmarks and stampings found on war-time mail from military prisons and camps during the war are sought after by historians and collectors, not only for their souvenir value but also as confirmation that various people, events and places existed at the time of mailing indicated by the name, address, postmark and other official markings. 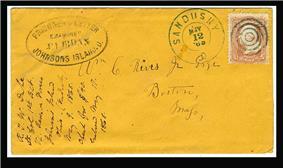 The mailed covers often bear the postmark of the nearest town or city from where the prison or camp was located. 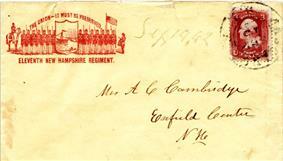 The study of Civil War military postal history and postmarks is an area of philately that involves a great volume of material covering town names, history, rarity, postmarks and other official markings found on mail to and from POW facilities. In the Nav-boxes below are two partial lists of some of the larger prison facilities, Union and Confederate, in operation during some or all of the war. Numbers for inmate totals are included to provide insight into knowing the amount of any surviving mail that is or may be in existence. There were also prison facilities that contained much smaller numbers of prisoners (a couple listed here) also. Records for some prison facilities are completely lacking, the total numbers of prisoners held, peak prison population amounts, escapes and deaths remaining unknown at the present time. Surviving prisoner of war mail to or from some of these places is exceedingly rare, and in some cases no covers are known to exist. 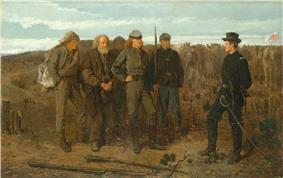 Prisoner of War cover to prisoner detained at Andersonville POW camp in Georgia. The franking privilege (free postage) for various C.S.A. government officials officially ended in March 1861 except for the Postmaster General and other members of his department. 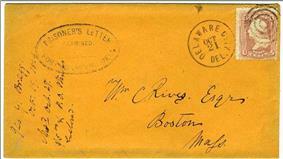 Other government agencies were required to prepay postage, even the Secretary of War during war time, as evidenced on this cover. Type II, also at first printed by Archer & Daly, is very similar to type I. Frederick Halpin designed and engraved the image of Davis. The corner ornaments are filled, and a faint line follows the outside of the design and encloses it. The Archer & Daly plates for both Type I and Type II were moved from Richmond to Columbia, South Carolina, when the fall of Richmond became imminent in late 1864. The company of Keatinge & Ball then printed the two stamps. A small number of Types I and II in Archer & Daly printings were perforated and released for use by the Confederate Post Office Department in 1864. The perforations (gauge 12 1⁄2) on these were often of notably poor quality, and forgeries abound, many of which betray themselves by perforations that either employ the wrong gauge or are cut too crisply. Type I, initially printed by Archer & Daly, Bank Note Engravers, Richmond, Virginia, employs the same engraving as the “Frame Line” issue but without the frame lines. There were approximately 23,800,000 stamps printed from two plates, each with two panes of one hundred. The earliest recorded usage is April 21, 1863. The next easiest to distinguish (on which the value is expressed as "10") has straight lines enclosing the design in a rectangle. 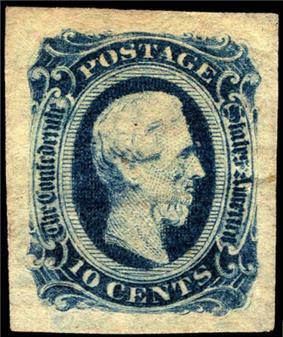 Several distinct shades of blue occur in this printing. The earliest recorded usage is April 23, 1863. All of these were printed by Archer and Daly of Richmond. 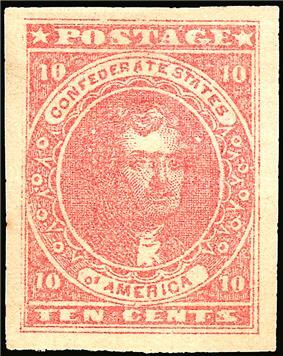 This "frame-line" variety is by far the rarest of the stamps issued by the Confederate Post Office. Even poor copies shorn of most of the framing can command prices upwards of US$1000. The easiest to distinguish from the other three has the value expressed as "TEN". The portrait of Jefferson Davis was designed and line engraved by John Archer, and then transferred to a copper plate. 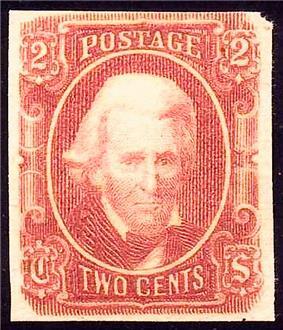 This issue was imperforate and was printed on soft, porous paper of varying thickness and with colorless gum. The earliest recorded usage is April 23, 1863. Color variations occur from dark-blue to gray-blue. 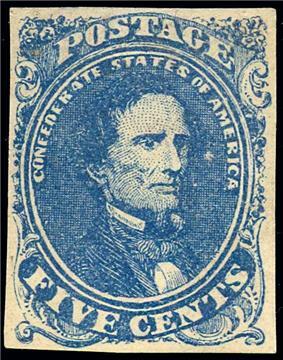 Also in 1863, a 10-cent stamp was released bearing the profile of Jefferson Davis in blue. This issue was designed and engraved on steel by John Archer and transferred to either copper plates or steel plates. Many shades of exist for these stamps, ranging from light milky blue and darker blue to shades that tend toward greenish blue and green. There are four similar designs of engraved ten cent stamps. In 1863, a new 2¢ Jackson design appeared, engraved in steel by Frederick Halpin and printed by Archer & Daly in pale red. A second printing appeared in brown red. Line-engraving would be employed in all subsequent Confederate stamps. 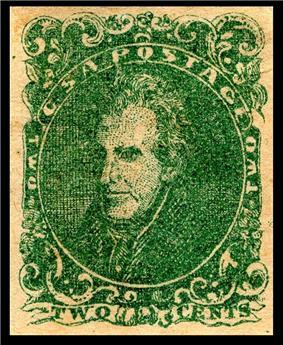 In 1862, a 2¢ stamp of Andrew Jackson appeared, in green, and was issued imperforate. This issue was again lithographed by Hoyer & Ludwig of Richmond, Virginia. Only one transfer stone used in this printing. 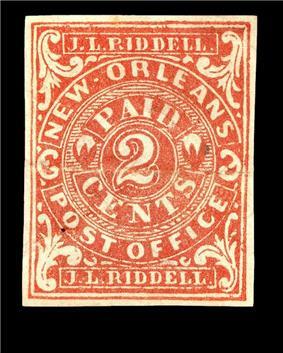 The earliest known usage of this stamp was March 21, 1862. Sheets of this issue consisted of two panes of 100 stamps each arranged in two blocks of fifty (10X5) taken from the 50-subject transfer stone with a wide vertical gutter between panes. 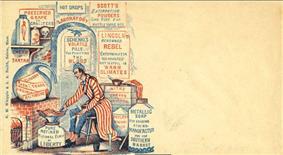 This was the last lithographed stamp produced by the Confederate Post Office. 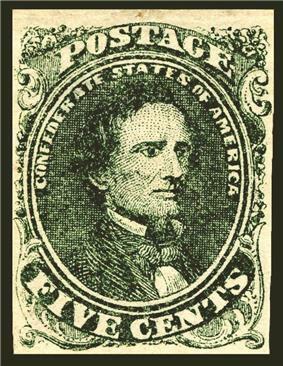 The first postage stamp issued by the Confederate States (1861) was a 5¢ green depicting Jefferson Davis. It was printed by the lithograph process by Hoyer and Ludwig of Richmond, Virginia. Like almost all Confederate issues, these stamps were imperforate, and single stamps had to be cut from the sheet with razors or scissors. 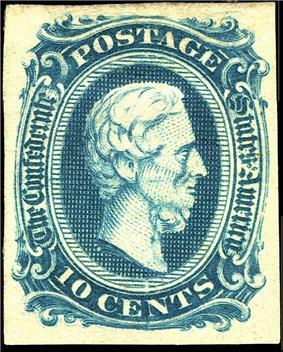 This stamp was reprinted in blue in 1862. 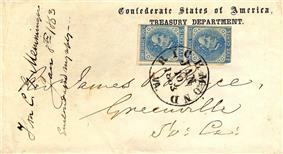 During the five months between the US Post office's withdrawal of services from the seceded states and the first issue of Confederate postage stamps, postmasters throughout the Confederacy used temporary substitutes for postal payment. Postmasters had to improvise and used various methods to apply confirmation of postage to mailed covers, ranging from the creation of their own adhesive postage stamps to the marking of letters with either rate-altered hand-stamps or the manuscript indication “Paid.” The improvised stamps and pre-paid covers are known to collectors as 'Postmaster Provisionals', so-called because they were used 'provisionally' until the first Confederate general postage stamp issues appeared. 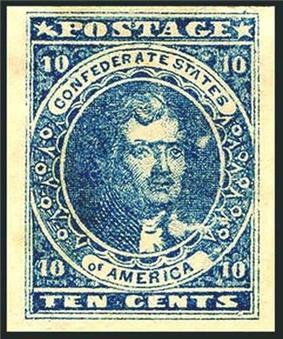 Some Confederate post offices would subsequently experience shortages in postage stamps and would revert to the use of Provisional stamps and hand-stamps. 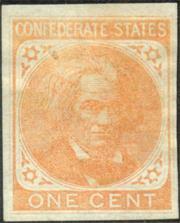 There are many dozens of types of Provisional stamps and hand-stamps from different towns and cities about the Confederacy. In some circles, Postmaster Provisionals are referred to as 'locals' since they were intended only for use from the town in which they were issued.
. These took a variety of forms, from envelopes prestamped with a postmark modified to say "paid" or an amount, to regular stamps produced by local printers. Some are today among the great rarities of philately.Postmaster's provisionals Most of the time they simply went back to the old practice of accepting payment in cash and applying a "PAID" hand-stamp to the envelope. 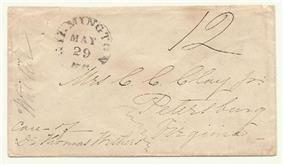 However, a number of postmasters, particularly those in the larger cities, could not afford to be handling long lines of cash customers, and developed a variety of Although the Confederate government had contracted for the printing of its own stamps, they were not yet available on June 1, forcing postmasters all over the South to improvise.